Non-Verbal reasoning appears in Bank exams, Infosys, MAT exams constantly. There are 5 Problem Figures (PF) will be given with 5 Answer Figures (AF). We need to determine the next figure in the series. There are certain rules which make solving these problems easy. So study the rules and solved examples. For all the series problems the following rules apply. If problem figures A and E are equal our answer is problem figure B. Similarly, the other rules as follows. In general, the items in the box takes different positions in the subsequent figures. They may rotate certain degrees either clock wise or anti-clockwise. Look at the following diagram. In some problems new items add to the existing figures and some existing figures vanish. Here PF(C) and PF(E) are equal. So Answer figure should be PF(B). So correct option is c.
The arrow is changing its positions clock wise 90o, 45o, 135o, 45o, ....next should be 180o. So option 3. A new symbols is appearing in the middle of the previous figure and the previous figure is getting bigger. So option 4 is the right option. 3 and 5 options are ruled out as the figures in the middle are appeared already. There appears to be no pattern on immediate look, but his problem can be solved by simple observation. 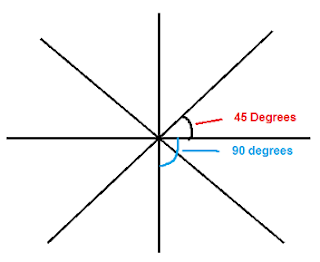 Have a look at the diagram below..
the arrow and small line inside the small square are rotating constantly anti clockwise and clockwise respectively by 90o, 45o, 90o, 45o,... and 45o, 90o, 45o, 90o . So next figure would be option 3. The line is rotating anti clock wise by 90o, 180o, 270o, 360o so next figure should be 90o from figure E and a new symbol must appear. So option 1 is the correct. Symbols X is rotating clockwise by 45o, 90o, 45o, 90o. So our options will be either 1 or 3 as in the next figure symbol X must move 45o. A new symbols is being added to X each time one at front and next time at back. So option 3 is right one. the symbols are changing constantly in clockwise direction and a new symbol is being added. The red rounded circle is a place whenever a symbol appear in that position must not appear in the next. And remaining positions are moving clockwise by 90o. A new symbol must come at the place shown by green arrow. So our option will be 1. Option 2 is ruled out as + symbol appeared earlier. Circle is moving diagonally and triangle is moving clockwise by 90o. So option 1 is correct one. Here you can easily observe that the lines are rotating 90o clockwise. also in PF(B) and PF(D), half line has added at the right most side and in figures PF(C) and PF(E) a new line has added. So in our answer half line has to be added and lines should rotate 90o. So answer option 2. Symbols in A, B are same except Symbols at bottom. A new symbol is coming there. Similarly in C, D. So option 3. Option 2 is ruled out as C appeared earlier.